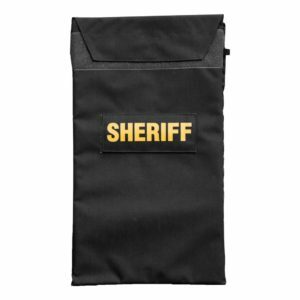 The BlastWrap® Sleeve attaches to our Stingray blanket providing military and law enforcement with a true bomb mitigating solution. Our patented BlastWrap® material works by dissipating blast shock energy and quenching the thermal output of an explosion. Regardless of the material or compound causing the explosion, BlastWrap® is able to mitigate blasts and suppress flash fires resulting from explosions. When used in conjunction with our Stringray blanket, the BlastWrap® Sleeve insert dramatically reduces an operators risk from explosives as well as ballistic threats. BlastWrap® is made from two laminated films the bottom one of which is thermo-formed into a cavity or pocket(s) and into which is put blast attenuating filler materials including volcanic glass bead or other suitable two-phase materials and a blend of extinguishments. The top film is then sealed onto the lower film forming a durable, flexible and configurable product (designed for each application) that offers unique and revolutionary blast mitigation/protection against all blast and fire/burn threats. BlastWrap® is a blast mitigation assembly that can be wrapped around or conform to any shape. BlastWrap® is a material (not a chemical compound) from which blast protection products are built to save lives and reduce explosion damage to people and valuable assets. All BlastWrap® components are “COTS”. BlastWrap® technology is unparalleled in dramatically mitigating the destructive effects of blasts of all kinds, including high explosives and other solids, gases and fuel/air deflagrations. We believe that blast mitigation is a cornerstone of emergency management as it dramatically reduces the impact explosions have on people and property. BlastWrap® is scientifically engineered and designed to remove much or most of the energy from explosions.